Alexander Lundstrom was born in Gothenburg, Sweden where he studied Yoga, Sports & Modern Dance from an early age to find relief and to alleviate the affects of the severe Scoliosis deformation of the spine which he was born with. This brought him into the path of a life long search for different solutions of healing and pain prevention in the human body. At a later stage he became a professional dancer and worked with major dance companies in Sweden where he also taught contemporary dance and body control. He has studied Yoga (Hatha, Raja, Kundalini, Tantra), Modern (Graham, Dunham, Limon, Horton) & Classical Dance with some of the most respected and celebrated Teachers in the world. He also trained in the Alexander Technique, Pilates and Mind-Body-Control, and Contact improvisation in India, Singapore, Sweden, UK and Greece. He was a Principal dancer with the Greek National Ballet of The State Theater of Northern Greece and has worked with Major Dance Groups and Choreographers in Greece. Alexander’s Yoga Teaching is based on Traditional Tantra Yoga according to the Shri Kali Ashram System, including Vinyasa Asana Practice, Breathing exercises, Meditation for Energy & Healing of the Physical and Emotional Human body, Cleansing & Balancing of The Chakras. He has a teaching experience of more than 25 years and holds a 500 YTT (Advanced Yoga Teacher Training Certificate). He still considers himself as a student of Life in all its forms. Alex is the best yoga teacher I have ever met. He explains everything about asanas and breathing practice, as effect you know what and why you are doing that. The lessons have a target and from the beginning of each lesson the student is prepared physically and mentally, in order to achieve that target. Never but never, you will do the asanas in the same series from lesson to lesson. We are very lucky that Alex is living in Rethymno. Alexander is everything you want in a yoga teacher. He knows what he is doing so you are safe; he loves what he's doing so you are enthused; and he is human so you can relax! The best thing about his classes for me, however, is that through the flow of movement between the asanas, you can detect the -- dare I say it -- spiritual element of yoga along with the physical, in a way that is accessible to us westerners. My whole family goes to Alex's yoga sessions and we all come away both exhausted and invigorated. We are learning to feel our bodies and that is a start! Alexander is a very experienced teacher, talented, friendly, with a beautiful heart and a great sense of humour. Alexander is both a fantastic teacher and human. He is a unique teacher and this is something you feel from the first second. He made me understand the real meaning of yoga and since then yoga is always a part of my life. It's the best gift I did to my self and I have tried different places, kinds of yoga and teachers because of traveling. I still haven't found the combination of his classes. 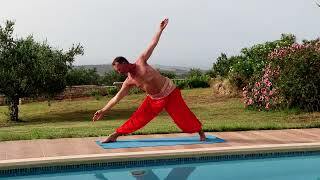 Alexander, is a highly experienced yoga teacher, who cares about his students. He will demonstrate, while explaining and help - according to the capability of the student- if adjustment is needed. Safety is one of his major concerns and he maintains balance between body and mind issues, according to what each student needs.